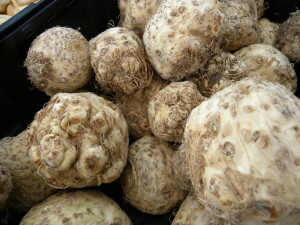 Celery Root, celeric, is narly, bumply root base for celery. Grated raw in salads, chunked for stew, pureed for soups or sliced thin with potato cooked au gratin or in potato salad with cream or added to cream of mushroom soup. Store in cool dry place like onions and potatoes. Flesh discolors soon after cutting. To avoid this place in water containing lemon juice.